Jimmy Emmons yielded impressive financial returns from swapping conventional methods for climate-friendly practices that include cover-cropping, soil-testing, and no-till farming. Jimmy Emmons may seem like a surprising advocate for regenerative agriculture. A self-described “recovering tillage addict,” Emmons spoke at the well-attended No-Till on the Plains 2018 Winter Conference in January about how adopting regenerative methods "have regenerated our lives." He and his wife Ginger have been farming and ranching in Leedey, Oklahoma since 1980 but it wasn't until about seven years ago that the family began taking the health of their soil seriously. The family learned to prioritize soil testing and cover crop rotation. They also decided not to plow their fields, which erodes soil quality. The new methods have paid off dramatically. The family realized better crop yields, cut its fuel costs by two-thirds, and halved its fertilizer use. The new practices improved the quality of their lives in other ways as well. Since they no longer have to ride tractors for "thousands of hours," says Emmons, they now have more time for each other and for friends. Following practices that more closely mimic nature also has environmental benefits. Emmons demonstrates how he's improved water infiltration in a short video where he points to a cross-section of a trench in his field after a rainstorm. Rather than pooling on the ground the water has soaked through the soil thanks to extensive earthworm burrows. In another video he shows off his biologically diverse, well-drained, and nutrient-rich soil. "It looks like the Grand Canyon around those soil aggregates," he says proudly. Another plus: Building up organic material in the soil rather than disturbing it allows it to capture carbon that would otherwise be released into the air. The Emmons are among a growing number of farmers making the switch away from conventional farming. The most recent data finds roughly 40 percent of the combined acreage of corn, soybean, wheat, and cotton, or 89 million acres of farmland, is grown using no-till or minimal till. High adoption rates of no-till practices have been observed in the southern and eastern regions of the United States. But the popularity of the No-Till conference in Wichita, Kansas, with around 800 farmers in attendance this year, suggests farmers further west are starting to embrace it, too. For Jimmy Emmons, there's no going back. 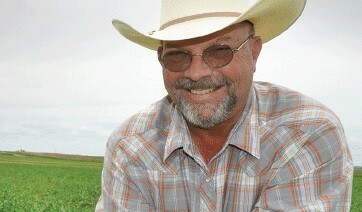 "We're now on the cutting edge of realizing that the soil is the future," he told his audience. It's a win for farmers, and for the environment.